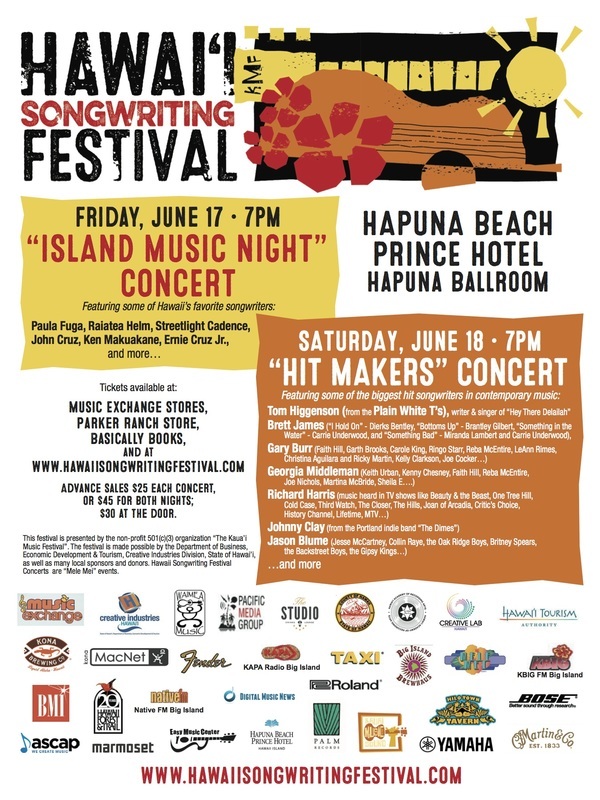 Join us in Hale Hoaloha at the Hapuna Beach Prince Hotel Ballroom for two intimate and exciting nights of music! Doors at 6:30, show at 7:00. Open seating. Kids under five are free! No hard tickets will be mailed - all tickets purchased online will be available at Will Call and held under the name used for purchase unless otherwise instructed. Choose from the options below and click "Add to Cart"
You will be directed to a checkout page, where you can enter the desired quantity and continue to payment. You will receive a receipt via email directly from Paypal. You do not need to bring this confirmation with you. If you need assistance in order to participate; such as an interpreter, assistive listening device, alternate format of materials, wheelchair accommodations, or any other special assistance, please email us at info@hawaiisongwritingfestival.com before June 6, 2016.